Demos Direct Initiative Party, quite a mouthful isn’t it but it is probably the most descriptive party name there is. Demos is Greek for ‘The People’, Direct means we believe in Direct Democracy and in government an Initiative is a procedure by which a specified number of voters may propose policies, constitutional amendment, or ordinance, and compel a popular vote on its adoption. Well in regard to the name DDIP really is what it says on the tin. Founded by Marty Caine, it became an officially registered political party on January 30th 2017. We thought that we had two to three years to build a party before the next General Election; Theresa May calling a snap general election changed that to six to eight weeks. Marty is standing in the GE2017 knowing full well he will not come anywhere but it shows the members and prospective members that we are serious in our aims to create change in British politics for the better and it is also an opportunity to promote our Save Our Loo’s campaign. How did the idea behind DDIP come about? Marty has been active in politics for some years now and saw something remarkable happen in the EU Referendum in 2016. What he witnessed was many people waking up from their political comas and they were hungry for politics. However, they did not like what was on the current menu and he knew it need something new, something that would change British politics for the better. When he looked at the power pyramid of other political parties with the leader at the top and power filtering downwards with the membership at the bottom, he realised that this was the main reason why most political parties become corrupted. You only need to infiltrate the top of the pyramid to take control of the party and we have seen this happen in UKIP recently. Marty is a staunch believer in Direct Democracy, though he knows full well that it is a Utopian idea in a country of almost 70 million people, where most of them have no desire to be empowered. 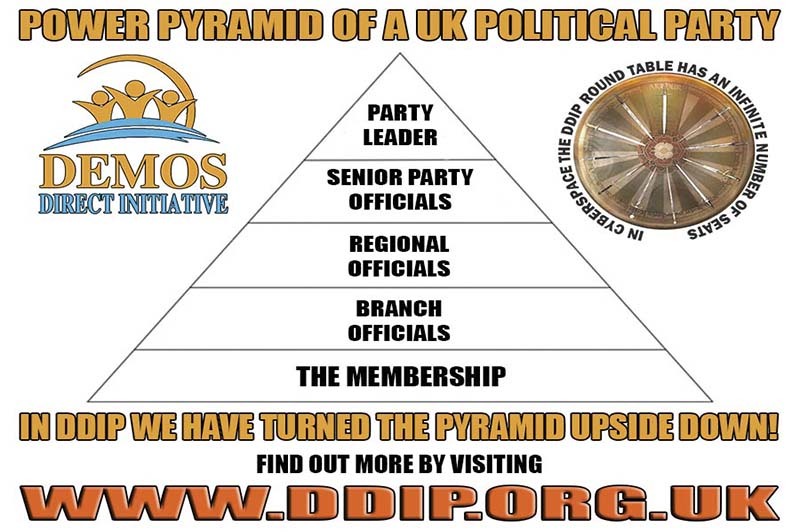 Within a political party it is possible, so he turned the power pyramid upside down and put the membership at the top, empowering them to shape party policies, structure and direction. The higher the rank within the party the more subservient that member becomes to the membership and as Leader of DDIP, he sees himself more of a janitor or maintenance man. For Direct Democracy to work within a party the membership needs to be connected and he has achieved this by the use of a purpose built members forum. Every member in the party has an equal opportunity to voice their own opinions and help shape every aspect of the party. Any member can put forward a policy idea and this is then debates by the membership on the form, members can login using their own personal data and contribute at any time that is convenient to them. It is available 24/7 365 days a year. This policy process definitely works well as we have already seen and proves our point that the collective thoughts of the many will always find better solutions faster than the selective opinions of the few. Direct Democracy and Collective Thinking are definitely the way forward in changing British politics for the better, through reasoned debates of opposing opinions we can tackle all the issues that affect us all and create well thought out commonsense solutions. When you read out NHS policy which is different to every other political party you will see the benefits of the DDIP way of problem solving. 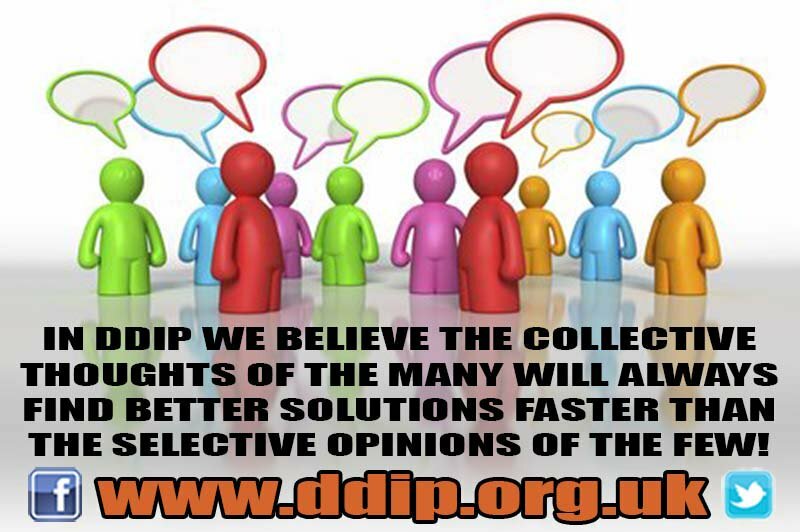 In DDIP we no longer believe in the outdated Left v Right political ideologies and encourage people from all across the political spectrum to join us in debating the issues with the sole purpose of finding solutions. The Left v Right only creates a system where people shout at each other instead of shouting at government and both Labour and Conservatives are more than happy for that to continue, in DDIP we are not and we have already found out that common ground can be found when the end goal is a sensible solution. We do believe that the best way to change British politics for the better is to change how a political party works and that is exactly what we have done in DDIP, we have provided the tools and a system whereby people have a real voice in politics, now it is down to the people to help make our dream become a reality.